After going on all day Monday, the pumping continued in the fog on Tuesday morning. Albany has jumped into action to deal with a big puddle of runoff that started overflowing a part of Broadway Street S.W. this fall. The city council got a report Monday from Manager Wes Hare and Chris Bailey, public works director of operations. 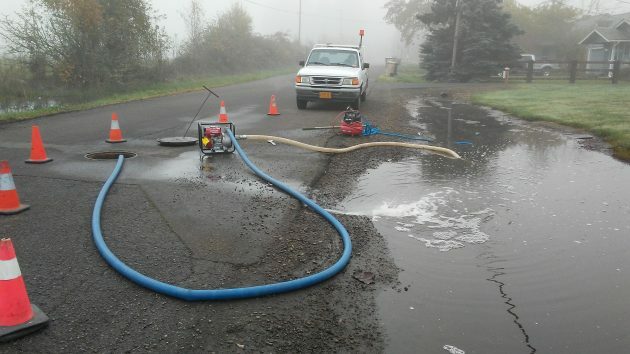 The gist was that public works had deployed a crew to pump away the standing water and is preparing a to build a permanent solution: A pipe to connect the area to an existing city storm drain about 150 feet to the south. From there, the water would head toward Oak Creek and the Calapooia River. At the same time, Hare and Bailey said, the city will have tests done on the surface water, which is draining from the Albany Research Center of the U.S. Department of Energy on the east side of Broadway. The city wants to make sure there is no pollution present in the runoff, which might complicate efforts to collect it and sluice it down the storm drain. The federal government did more than one evaluation of the Research Center’s undeveloped 14-acre “South Forty” on the east side of Broadway. A report from the 1980s documented some traces of radioactive elements in the water from the field but said they were harmless. Later, after more reviews, the government declared the site to be free of any restrictions. This story has been updated with a photo from Tuesday morning. Good work again from a stellar city staff. I’m sure the crazy conservatives will throw their mud, but the problem will get fixed as soon as possible. People might also want to ask Rodger Nyquist why the hell Linn County hasn’t upgraded their part of the road to full urban road standards. Rodger sure is willing to comment on Benton County and ODOT on the Independence Road connection. But he stays pretty deaf and dumb on getting county roads up to snuff, especially when he can pass the costs off to someone else. Nyquist’s failure to make Linn County roads comparable to those found in Polk County, in conjunction with Nyquist’s ongoing griping about Benton County roads demonstrates how Nyquist uses distraction and name-calling to keep Linn voters from examining his rather easily demonstrable shortcomings. According to who are Linn County Roads “among the best.” That seems a rather broad brushstroke, even for an old wordsmith such as yourself. I realize you are no longer under any ethical restrictions as your blog is not a for-profit news gathering organization. But in this case, you sound as though you were reading from the Roger Nyquist playbook as regards Linn County roads. We thank you for what you do. Ooooo! “Crazy conservatives!” Please, Bob. You cut me to the heart. But even Hillary can’t undo the vox populi that was sounded yesterday… for another four years, anyway. Better learn to live with it. Interesting choice of words when you consider who won the popular vote. Fear not. Under President Trump, all water will flow away harmlessly, making Albany great again. Har Har Henrietta. You sound like a bitter Democrat. Well get used to it. You only have four years before you get to try again. Thanks for the update, Mr. Hering. Keep us posted when the test results come in. Did they say if they were testing for radiological or organic compounds, or both? They didn’t say, but I assume both.